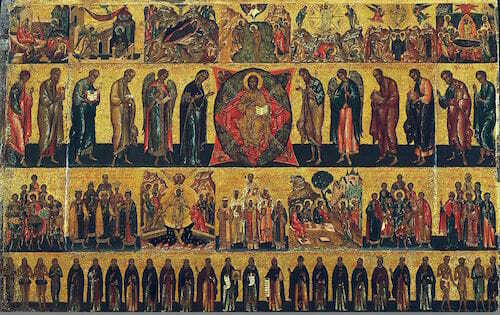 The Saints were people just like all of us. Many of them started with grievous sins but through repentance they attained to the Kingdom of Heaven. And everyone who reaches the Kingdom of Heaven does so through repentance, which the Merciful Lord granted us by His sufferings. 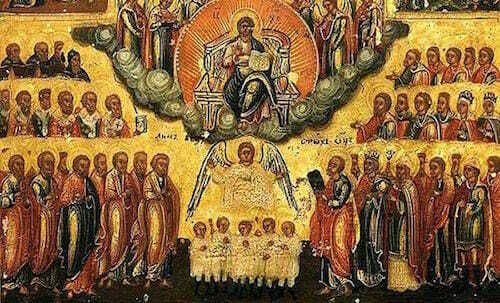 In the Kingdom of Heaven where dwell the Lord and His most pure Mother, abide all the Saints. There live our Forefathers and Patriarchs who valiantly carried their faith before them. There dwell the Prophets who received the Holy Spirit, and by their exhortations called the people to God. There dwell the Apostles who died that the Gospel might be preached. There dwell the Martyrs who gladly gave their lives for love of Christ. There dwell the holy Prelates who followed the Lord’s example and took upon themselves the burden of their spiritual flock. There dwell the holy Fathers who lived lives of prayer and fasting, and those who assumed folly for Christ’s sake, all of whom fought the good fight and thereby overcame the world. There dwell all the Righteous who kept God’s commandments and vanquished their passions. Thither aspires my soul – to that wondrous holy assembly which the Holy Spirit has gathered together. But woe is me! Inasmuch as I lack humility, the Lord does not grant me the strength to fight, and my feeble spirit flickers out like a tiny candle, whereas the spirit of the Saints burned with a bright flame, which the wind of temptation not only failed to extinguish but set burning more fiercely than ever. They trod the earth and worked with their hands but their spirits continued with God, of Whom they were ever mindful. For the love of Christ they endured every affliction on earth, and feared no suffering, and thus glorified the Lord. Wherefore the Lord loved them and glorified them, and granted them the eternal Kingdom with Him.